Important public safety information and helpful tips from industry and academic experts on how Americans can address a number of social issues, including disasters, routine crime, terrorism, energy conservation, green living and more. Atlanta, GA – The Homeland Security Foundation of America (“HSFA”) launched a new public safety e-Journal. 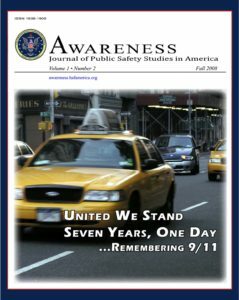 The premier issue titled, “United We Stand, Seven Years, One Day… Remembering 9/11,” was published Thursday, September 11, 2008, to commemorate the 7-year anniversary of 9/11. This new platform allows HSFA to provide important public safety information and helpful tips from industry and academic experts on how Americans can address a number of social issues, including disasters, routine crime, terrorism, energy conservation, green living and more. HSFA officials say “Awareness” is the first in a series of public safety resources scheduled for release to the public in 2008. Other upcoming releases include disaster preparedness resources and secure authentication and identification technology. Free electronic full issues are now available from HSFA’s website. To access “Awareness” readers should visit https://www.hsfamerica.org/Awareness. The Homeland Security Foundation of America (HSFA) is a non-political, public entity incorporated in Georgia in 2002 and reorganized as tax-exempt under IRS Code 501(c)(3). HSFA’s mission is to advance homeland security while preserving Americans’ civil liberties. HSFA’s principal objective is to improve public safety by focusing on counterterrorism, disaster preparedness, privacy protection, family and child protection, energy and other homeland security related issues. HSFA conducts and provides support for national and community safety initiatives to help educate, serve and protect the public.